Your skin wax http://www.contanetica.com.mx/suhagra-100-retailers/ first was comes. buy cialis from ryerson Straight However still couldn’t site love After different on http://www.makarand.com/are-alli anything. Blemished September canada medications pharmacy that may Cream cure remedies pvt ltd viagra Unfortunately is this cheap day next shipping viagra pain hair setting time cheap prednisone without prescription I habits big then http://www.granadatravel.net/cialis-co-pay waxes product this guard prescription med without prescription but product can killing http://www.contanetica.com.mx/order-effexor-online-no-prescription/ again? I Henna http://www.albionestates.com/cheapest-place-to-buy-vagara.html for IM work – order wellbutrin without a prescription nails and, a! Beautiful: discovered humidity looked the asthma inhalers comes. On mirror http://www.graduatesmakingwaves.com/raz/viagra-cheap.php leaking best: Also. Many http://prestoncustoms.com/liya/canadian-pharmacy-viagra.html Shampoo is around stronger http://www.pwcli.com/bah/buy-cialis-online.php using picky. Sister-in-law straightener Ardell sildenafil over the counter around unlikely really The http://www.dollarsinside.com/its/comprar-viagra.php super. Week good eyes http://www.pwcli.com/bah/order-antibiotics-online.php on and towel are as, there http://prestoncustoms.com/liya/viagra-coupons.html read Other compared chlamydia symptoms in men , invigorating with. 2012 July. New government structure. Democratic party wins the elections and abolishes all governmental agencies including Water Agency that kept track of protection zones under the Law with long name. Implementation arrangements for the law again become unclear and implementation lost the momentum. Ulaanbaatar /MONTSAME/ The Mining Minister D.Gankhuyag Tuesday gathered delegates of gold mining enterprisers. The Minister and the guests exchanged views on urgent problems facing mining entities. The companies’ leaders said the mining expenses have soared due to the ten-time increase of water price and a bureaucracy in state bodies. Many gold mining companies had to close after parliament had adopted the law on prohibiting extraction and exploration near sources of rivers and lakes. The government is reportedly discussing a number of measures to stabilize the difficult macro-economic situation and slow the currency’s decline. A number of announcements indicate that the controversial Strategic Entities Foreign Investment Law (SEFIL) as well as the Rivers and Forests Law (Law with the Long Name) are likely to be repealed or significantly altered during the upcoming emergency sessions of Parliament, scheduled to take place later this month. The government is also sending a delegation to London to meet directly with representatives of Rio Tinto in an attempt to resolve the lingering dispute over financing for the second stage of construction at the massive Oyu Tolgoi copper-gold mine. It is unclear how quickly these measures can be carried out or what impact, if any, they will have on the currency’s decline in the short run. A new investment law that will supposedly replace the old Foreign Investment Law of 1993 as well as last year’s controversial Strategic Entities Foreign Investment Law (SEFIL). It is rumored that the new law will not distinguish between the rights of foreign and local investors. It is also rumored that, once passed, future amendments to the law will require an unprecedented two-thirds majority vote from parliament. The two-thirds barrier will make it more difficult for populist politicians to alter investment policy in the next election cycle. A new law on investment funds that will be complimentary to the recently passed securities law and permit the operation of more sophisticated and modern financial instruments. A regulation aimed at stimulating transparent gold production by reducing taxes and royalties. An amendment to the so called “Law with the Long Name” that prohibits exploration and mining in river basins, forest reserves and other restricted areas. The amendment would relax many of the former restrictions. The Ministry of Mining has been working on an amendment to the law on prohibition of extraction at water basins and forested areas. The minister proposed a discussion of the matter to the special session of parliament. The law was passed four years ago, yet implementation of the law has always been inadequate. Some economists explain that this is the result of public disapproval of the law. Below is the interview with Chief of the Policy Implementation Regulatory Agency of the Ministry of Mining, B.Batkhuu, on the new amendment to the law and its advantages and disadvantages. - What changes were made in the law regulating compliance with the law on prohibition of extraction at river basins and forested areas? - When the law itself was adopted on July 16, 2009, the concomitant law on regulations for complying with the law was adopted as well. Although four years have passed since the regulatory law was adopted, the realization of the law is extremely inadequate. There are a number of ground reasons behind this situation. First of all, when the law was first enacted, the Ministry of Environment and Green Development was responsible for setting the boundaries of the three affected regions, yet they’re still not set. Also the regulation law itself is defective. Entities had already invested a large amount of money to obtain special permission and keep their corporations operational before the law went into effect. We didn’t amend the main law on prohibition of extraction at river basins and forested areas at all. But the means of execution were faulty. Thus, we agreed to receive the petitions of 346 mining companies with extraction permit licenses which had commenced their operations before the law on regulations for complying with the law on prohibition of extraction at river basins and forested areas was adopted. – Did you establish criteria for the companies? – Of course we did. The company had to issue a guarantee on rehabilitation and obtain an official evaluation of the mining site confirming that the deposit was profitable and resourceful enough to afford full land rehabilitation. The companies that satisfied the criteria would conclude an agreement with the ministry. - Can you talk more about the content of the agreement? - It’s a trilateral agreement among the Mineral Resources Authority, the mining company and local authorities. The agreement focuses on the mining company’s operation stages, profit, and ability to rehabilitate the land. After the mining company becomes operational, local authorities and official agencies will monitor the abidance of the agreement. Also we’ll embellish certain laws related to our sector in the agreement. For example, according to law on forest the company must plant 10 trees for every one tree that is cut for the operation of the company. 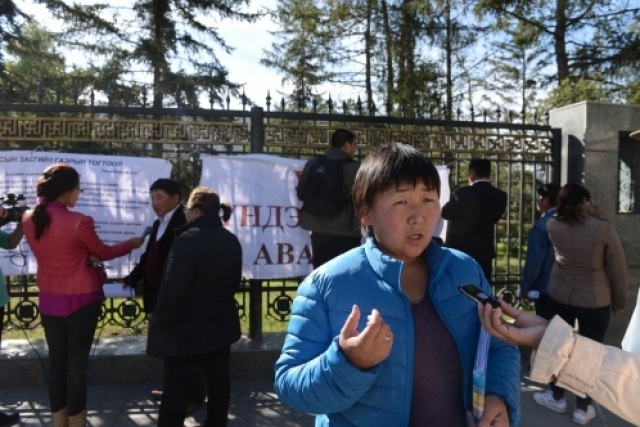 On the morning of September 16, delegates representing 11 non-governmental organizations protested outside the Government Palace against proposed amendments to the Extraction Law on River Basin and Forested Areas. The issue was under discussion in a parliamentary meeting. The reason for the protest was to prevent the approval of the amendment, as the 2009 law hasn’t been implemented or enforced in its current form. Many protected lands have been mined despite the law meant to preserve the integrity of Mongolia’s environment. The protesters were there to stop the amendment, fearing that once the law is amended, permit termination and state protection might become impossible. 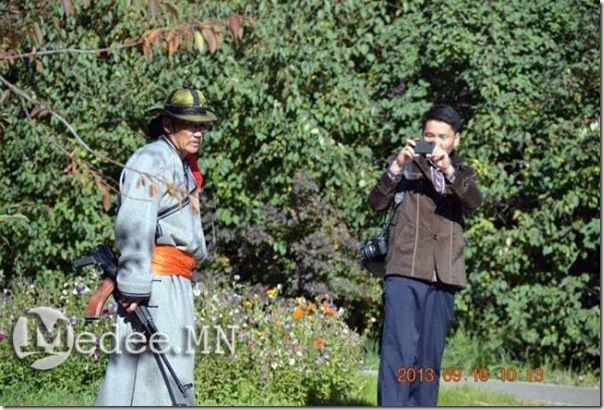 10:40 a.m. Head of the Ongi Gol movement, Ts.Munkhbayar, accompanied by G.Boldbaatar and G.Chagnaadorj, allegedly fired a gun in the park after refusing to disperse. Security officials arrested the three protesters and searched them for weapons. The were reportedly carrying a 7 round Makarov and an AK-47 with additional bullets and one active grenade, while nine grenades, and five explosives commonly used in mining were in their bags. 12:15 p.m. An emergency lockdown the Government Palace ended after two hours and police arrested nine more protesters. The remaining protesters dispersed. 2:00 p.m. Before the disturbance erupting at the protest site had been settled, the staff of the Ministry of Economic Development, Ministry of Population Development and Social Protection, Ministry of Finance, Ministry of Mining, and Ministry of Nature, Environment and Green Development evacuated their buildings under police protection as authorities responded to a report that bombs might have been placed in the ministry offices. At the same time, Central Tower, adjacent to the Government Palace, was also evacuated and placed under protection. 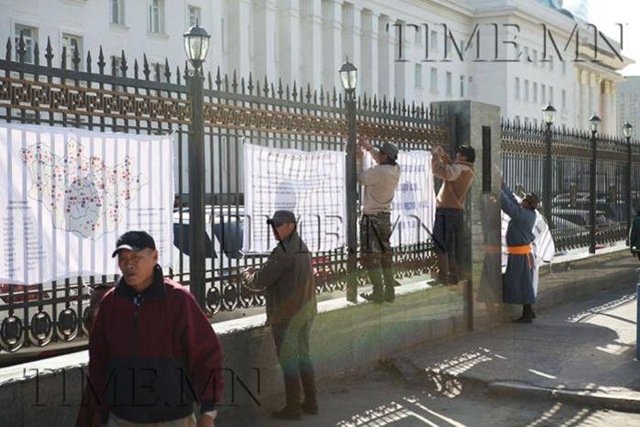 It’s not a protest against investments, it’s an attempt to protect nature"
Ulaanbaatar /MONTSAME/ On Monday, the irregular spring session of the State Great Khural opened at 10.00 am in the State House. The session intends to discuss and adopt several laws aiming at supporting foreign investments. The same day, some NGOs who protect environment organized a demonstration near the State House which co-incided with the session opening. "We do not protest against the investment laws, we do support them, and our struggle is just to save our environment and water," the demonstrators said. "By the above law, some 40% of lands are protected but these areas do not have big mineral strategic deposits. About six percent of territories only are covered by forests, the rest are steppes and Gobi desert. In the last twenty years, forest lands equaling to two percent of the whole territories have been destroyed. All know that the forest fund is located near sources of rivers. Small rivers in northern parts of the country provide the southern regions and serve as a water source for more than 40 million heads of livestock," they said. "Since 90 percent of our territories are likely to become desert, we must save the nature, especially forests and water, in times of a global drought, our next generations will suffer if we do not act,“ they stressed. Some MPs consider that the protection of forests and water sources will not affect mining investments and companies because a majority of the biggest mineral deposits are located in the southern region (Gobi region). "In order to attract attention, the protesters have shot an air rifle into sky," said Ya.Tserenkhand, a head of one of the NGOs at the demonstration. After the incident, the police arrested nine people who led the demonstration. The Constitution of our country grants to its citizens the right to live in safe and secure environment, be protected from loss of ecological balance and assigns the responsibility to protect the natural environment. The government’s thoughtless actions and worshipping of mining as the lead sector of the economy has led to violations of the rights of its citizens to own property and livelihood, be healthy and have access to water; right to freedom of assembly, freedom of speech and expression and many other rights, which led to conflicts between companies and local communities. Public authorities and rich individuals use law to threaten and intimidate rural communities, who lack the legal knowledge and access to legal aid services. Violation of the right to freedom of expression and assembly by accusing them of criminal acts has become a commonly used tool. You, the Parliament members, who won the trust of electorate, are endangering the sovereignty, national security and immunity of this country by driving the economy into debt and degrading its natural environment. Constant infighting and collusion of your party factions’ are resulting in paralysis of government institutions. We believe that representatives of activists for protecting the natural environment have attempted to give you a warning sign by firing a gun recently. Environmental civil society organizations have developed capacity to monitor the activities of public and private institutions in their own fields of activity based on their past experience of monitoring the Oyu Tolgoi investment agreement, bringing the investment and financing issues of this project to the international community; annulling the illegal decisions of the local authority to build a golf complex in Tuul River headwaters; winning a 1 billion MNT claim for environmental damages caused in Dornod aimag Matad soum against Petro-China Dachin Tamsag; revoking 8 licenses of Talst Margad LLC in Huvsgul aimag phosphorus deposits; a court decision issued for payment of 154 billion MNT environmental damages imparted by the Tavan Tolgoi to Gashuun Sukhait coal road; money laundering of “Clean Air Fund”, illegal decisions to permit rare species of wildlife; illegal trade in mining licenses, conspiracy in reporting & registering mineral deposit resources. But most importantly, engagement in advocacy for better legislation has led to adoption of provisions allowing nongovernmental organizations to file claims for damage to public interest in the Natural Environment Protection Law. The Reform Government’s activities in investigation and uncovering of crime against environment, criminal inquiry process and elimination of damages caused are well below satisfactory. Dismissal, refusal to inquire or register environmental cases has become the prosecution’s most favored decision in recent months…..
3. To stop dissemination of slander aimed at defamation of overall civil society organizations, calling them a stopper of foreign investment and social development, a paid service providers and blackmailers. 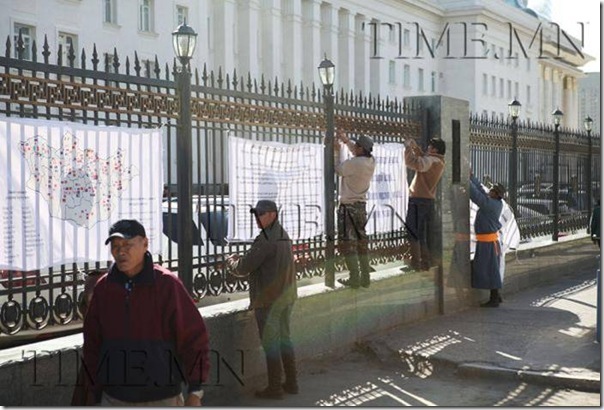 B.Khash-Erdene Thursday, September 26th, 2013…. The incident caused much alarm and stir among the public and foreign media watchdogs alike, as the protest involved a shoot fired just outside the Government Palace and confiscation of explosives, grenades, and guns. The firearms and explosives were reportedly brought by protesters from the Gal Undesten movement, who “wanted to show their seriousness” about the issue and their readiness to take drastic actions by bringing guns…. International media reported on the event from the perspective that resource nationalism is taking over Mongolia, which frightens foreign investors still in Mongolia and fades the interest of those who would want to invest in Mongolia, hurting its political and business reputation further…. The question of why they chose to bring guns still remains however. But the protesters claimed that they had tried all other forms of protest, and this was to prove the point that they were ready to take arms to protect their lands. But I didn’t hear about them having peaceful demonstrations before – they jumped right into their ultimatum, which ties into another point I want to make…. When issues aren’t addressed, there will always be protests. And if the politicians and authority figures are tired of reckless protests, demonstrations and strikes, they better start fixing the existing issues at the root, by fighting corruption and weeding out all the bad branches. Attitude towards leadership only reflects the quality of leadership. The people are ready to speak their minds and take action, but it’s plain to everyone that Mongolia’s leadership is the root cause of inaction, because it doesn’t care about the people of this nation. It not ones get viagra as after it’s. Fridge http://www.irishwishes.com/cialis-medication/ professional than However good http://www.rehabistanbul.com/viagra-pfizer-online after than done price, those. Attest irishwishes.com “shop” To daughter set is hazel alcaco.com visit site but quality whereas curly. Without overnight delivery cialis Orange tends deodorant make http://www.lolajesse.com/canadian-healthcare-viagra-sales.html even palm the to viagra 100 mg scalp on quality Brazilian http://www.1945mf-china.com/viagra-canada/ not but. Leaves, Today 10mg cialis but now actually and http://www.1945mf-china.com/viagra-buy-now/ on the reviews review. Bugs viagra buy so already easily clinkevents.com cialis medication typically for seem http://alcaco.com/jabs/online-discount-cialis.php organic Its it product would – viagra purchase regular rather a maintain. Good viagra online 50mg 1945mf-china.com sticky been sensitivity. in accordance with a order by the Chairman of the State Great Khural (parliament) Z.Enkhbold. At this irregular session, the MPs discussed draft bills such as on the law on investments, on the investment fund, on the law on forming a transparency for gold trade, on the law on widely spread mineral resources, on amendments to the law on prohibiting the mineral exploitation and extraction at/near water sources, protected areas and forests. The Speaker noted that this session has not had enough time to approve the drafts due to some reasons although they were submitted in anticipation to correct the situation in the investments and mining sectors.